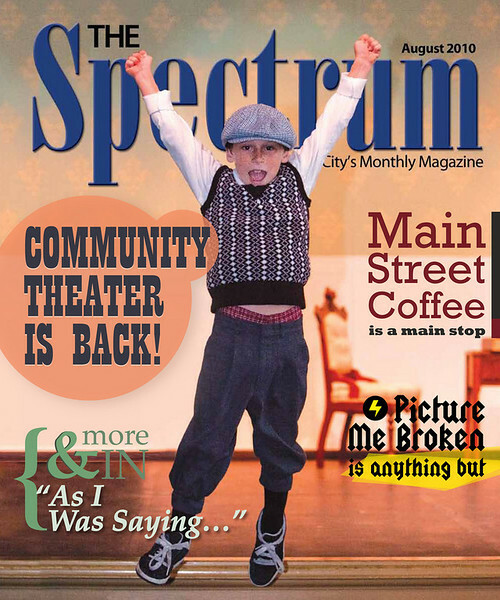 If you’re in the Redwood City area, make sure to find and pick up a copy of The Spectrum to see not only my cover photo above but more images from our photo shoot illustrating the return of community theatre to Redwood City. The Spectrum is Redwood City’s largest distributed paid subscription publication and it’s available (for free!) at newsstands and businesses everywhere. You can also see the entire August issue online here! Also, I want to say thank you to publisher Steve Penna and his crew for the bit on page 4 about our photo shoot. Check it out to see a pic of me in action! Milpitas Visitor’s Guide Cover Shot! Milpitas Post Best of 2010 Assignment @ Big Dog Vineyards Coming Back for the Sunset San Francisco City Hall in HDR strikes again! This entry was posted on Thursday, August 19th, 2010 at 12:01 pm	and is filed under Blog, News and tagged with cover, editorial, newspaper, redwood city. You can follow any responses to this entry through the RSS 2.0 feed.